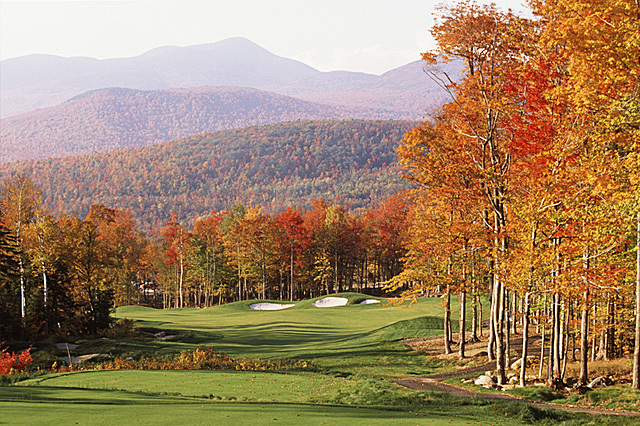 Golf in Maine is legendary; some of the most challenging and scenic golf courses are in the Pine Tree State. There are golf courses that overlook the ocean, some are surrounded by lakes and rivers while others are nestled in the mountains with dramatic views. Nature has sculpted some of the most spectacular terrain in the United States across Maine’s so it makes perfect sense that top golf-course designers would want to share a bit of that beauty. And they have. Golfers will find Maine country clubs and public golf courses that cater to every style of play. The golf season starts as soon as the snow melts, continuing through the prime summer months and into the fall when the green fairways are surrounded with a burst of beautiful foliage colors. Many golfers think fall is the best time to golf in Maine. With over 130 golf courses, golfers will find an excellent variety of public and private country clubs (many of which reserve a few tee times for guests and visitors). Maine is the perfect destination for a golf vacation, since there is so much more to do, be it boating, touring, or just enjoying a fresh Maine lobster and a Maine microbrew. Many Maine resorts and inns offer golf stay and play packages.